The front door of your home says a lot about your personality. After all, it is the focal point, the entrance, the pass-through for every guest, family member, and friend. Should it not make a statement about your unique disposition? In Scarborough, ON, Brock Doors and Windows aims to match your personality and needs with our beautiful, quality front doors. Let’s break down the key points together, and get you ready for that gorgeous Scarborough, ON front door you’ve been dreaming of! Color, hue, shade, dye, pigment! Let’s begin with color. According to leading color experts, your choice of a front door color will immediately set the tone for guests. Check out these colors and match to your personality! – White: Are you a “neat freak?” Do you like things orderly and organized? Let everyone know with a crisp, clean, white front door. – Blue: Opposite of the white front door—this color suggests yours is a family with a laid-back, go-with-the-flow personality. – Wood/natural, earthy shade: Traditionalists! Choosing a natural hue or earthy material means you most likely enjoy the outdoors and/or prefer traditional home values. – Steel/black: A no-nonsense family lives here. This door is for you if you prefer straight-shooting, direct conversation, and practical relationships. Design, style, shape, fixtures, scheme, flair! – French doors: These add a dramatic touch to any entryway. If you want to add flair to your house, consider these gorgeous double doors. There is something so imperial and elegant about this option, don’t you agree? – Huge windows: Natural light is uplifting and inviting. A large glass pane—clear or obscure—suggests a welcoming personality; inviting, nurturing, open-book. – No glass (solid door): Most likely, this door will have a peep-hole added. As you might assume, this door is for a private family or a one which values a quieter lifestyle. – Door knocker: This, too, works well for a family with traditional values a home with a sophisticated vibe. Note: there are various whimsical, industrial, and rustic style door knockers as well for many other personalities and styles! – Knobs/handles: There are so many options to support your personality. 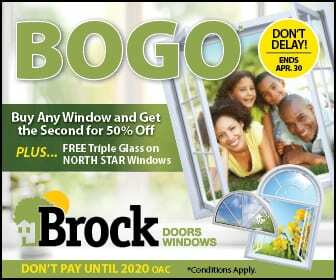 At Brock Doors and Windows, we have hardware choices for any style: bold, quiet, reserved, traditional, modern, etc. Want an antique-inspired knob or a contemporary level handle? We have you covered! A home which reflects your personality begins with your front door. Give our team a call! We would love to discuss options, learn your design aesthetic, and meet your needs. Your Scarborough dream home is just behind your new front door!